Everyday interactions between caregivers and children build the foundation for children’s social-emotional and cognitive development. Research shows that when caregivers are responsive, warm and sensitive to children’s needs, children develop confidence, resilience and communication skills. These skills help to prepare children for interactions with others and to work through problems, manage stress and form healthy relationships. Caregivers who engage children in different opportunities and experiences help them to develop a love of learning. For example, caregivers might encourage shared book reading, constructive play, independent exploration and participation in decision making. 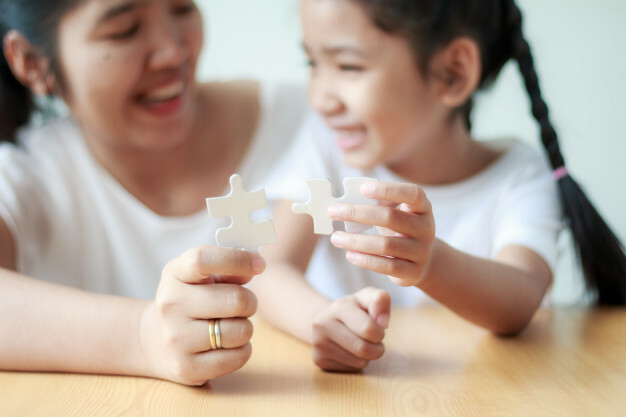 Children also benefit academically when caregivers engage them in conversation, use new vocabulary words, provide a literacy rich environment and embed problem solving in everyday family activities. Engage in responsive, warm and sensitive interactions. • Attend carefully and listen actively when your child speaks to you by using eye contact, head nods, caring facial expressions and encouraging gestures that demonstrate empathy, engagement and validation. Allow enough time for your child to share, and avoid interrupting. • Provide toys and activities that are appropriate for your child’s development and understanding. Check the labels on toys to see if they are age appropriate. • Be available when your child needs support, and recognize that all children have different needs. Perhaps your child needs your help with a transition routine, or to get ready for bed time. Perhaps your child needs you to arrive a bit early for school pick-up so they do not wait nervously. As you consistently identify and meet your child’s needs, they learn to trust and respect you. • Let your child take the lead in conversations and play by supporting their ideas. Avoid the temptation to direct all interactions, but instead show acceptance. For instance, if your child is pretending that stuffed animals are alive or wooden blocks are food, that is okay. • Notice your child’s interests and play preferences. Suggest doing what your child enjoys and have fun together! • Establish predictable, back and forth verbal and social interactions with your child to enhance their language and cognitive abilities. Challenge and support your child’s learning. • Try elaborating on your child’s communicative attempts by repeating, rephrasing and expanding on your child’s words and non-verbal cues. • Use phrases that build on what your child is thinking about and contribute to what they want to investigate. Support your children’s language development by introducing and defining new vocabulary. • Ask open-ended questions that cannot be answered with a “yes” or “no.” When you ask children to provide detailed responses, you support their developing thinking and comprehension skills. • Be aware of your own emotions because children look to you for ways to express and regulate their emotions. For example, if you model self-talk for calming yourself when you are angry, you will model for your child how they can use the same technique. If you control your voice volume when you are excited, you will show your child how to experience intense emotion and use self control at the same time. • Children attend to everything you say and do and may imitate words and actions – try to be your best self. However, it is okay to make mistakes. Consider it an opportunity for modeling. If you make a choice you regret, take responsibility and help your child understand what you wish you had done instead. These strategies can be used anytime and anywhere. You can create high quality interactions during transitions, travel time, daily routines, meals, bath time and play time. Everyday interactions matter! This entry was posted in Family Matters, Milestones & Learning and tagged children, family, interaction, support on March 20, 2019 by admin.